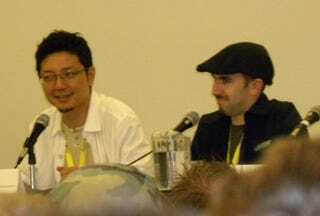 During a Q&A session following the Comic-Con 2009 Lost Planet panel, game producer Jun Takeuchi let slip that players would be taking to the air to do battle against the Akrid in the game's sequel. The news came after a member of the audience asked if there would be more co-operative vehicles in the game in addition to the three-player mech we were shown during a brief demo. In response, Takeuchi explained that there would be more co-op vehicles, and some of them would fly. After the panel was over I confirmed with Takeuchi's translating partner that yes, this was indeed new news and no, they might not have been supposed to say that.